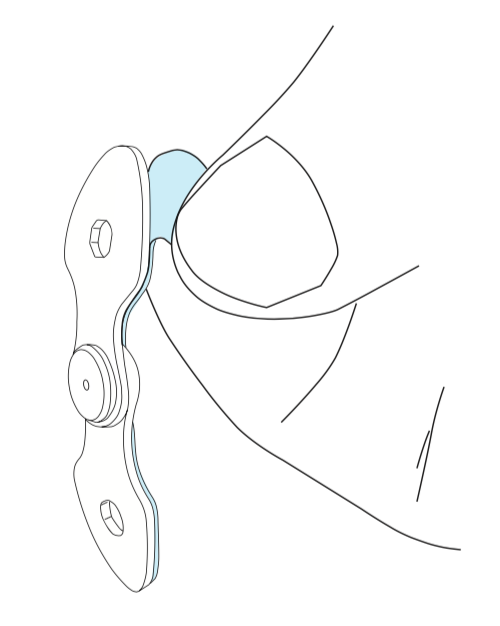 Pivot Joints are intended to provide free motion articulation for Ankle Foot Orthosis. T-PCH05L-150- Sand Cone, 150 grit, 5/16"
1. Begin by preparing your AFO model for vacuum forming. 2. Mark the ankle joint axis, taking care to keep it parallel to the axis of rotation of the foot (A). 3. Mark the medial and lateral joint locations (B). 4. Mark Hinge Plates with a permanent marker to identify the medial and lateral ankle joints and to indicate orientation. This is important, as you will be forming each ankle joint to the model (C). 5. Trace an outline of the ankle joint on the positive model at the established ankle joint axis to allow accurate placement when forming the Hinge Plates to the model (D). 6. Use your fingers (or a tool) to form the Hinge Plates to the positive model (E). 7. Cover the plaster model with a nylon hose. Skip this step if using a spacer for an inner boot. 8. Peel the backing from the adhesive on the white Fabrication Pads attached to the Hinge Plates and stick the ankle joints to the model, paying careful attention to their alignment (F). 9. Insert a brad nail (included) into the center hole of the Articulating Rivet and drive it flush to ensure the ankle joint does not move. 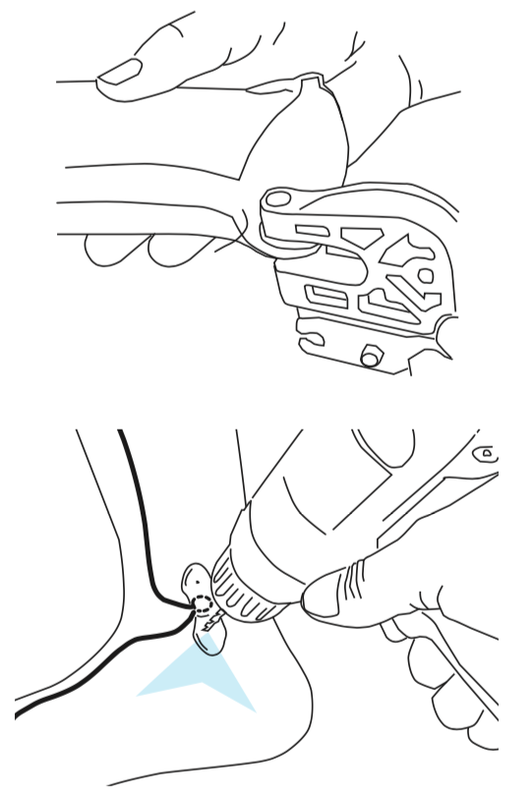 Note: use of the nail will also help with removing the joint from the cavity after forming (G). 10. Cover the joint and the model with a very thin nylon hose (e.g., Feather Stretch), taking care to ensure the proper positioning of the joints. 11. Vacuum form as usual, ensuring a good seal and tight vacuum. A very close fit between the joint and the cavity is critical to the performance of the joint. 12. Once the plastic has cooled, remove the AFO from the positive model. The brad nail should pull easily out of the model. 13. With a marking pencil, establish your trim lines around the ankle joints. It’s important that the trim lines extend all the way to the Articulating Rivet to ensure proper support for the joint (H). 15. Finish trimming out the AFO ensuring that the plastic extends all the way to the Articulating Rivet to ensure proper support for the joint. 16. Using a 13/64” or a 5mm bit, create a pilot hole in the AFO at the center of the Articulating Rivet cavity. Using a 7/16” or 11mm bit, drill a larger hole in the cavity. This will establish the trim line around the Articulating Rivet (I). 17. Use the Pivot Punch tool (available for purchase) to quickly and accurately create your mounting holes in the AFO. If you don’t have a Pivot Punch tool, use a 13/65” or a 5mm bit to drill mounting holes into the dimples, created by the Indexed Hole, at the top and bottom of the hinge plate cavities. 18. Peel off the white Fabrication Pads from the joint. There is no need to clean off the residual adhesive as the Finishing Pads will cover this (K). 19. Install Pivot ankle joints in their respective cavities and secure with Indexed Nut and Ultra-Low Head Torx 15 Screws. NOTE: MUST ADD LOCTITE 263 (24 hour cure). 20. Peel the backing off the Finishing Pads and adhere the pads to the inside of the Hinge Plate (L). This product should only be used for its intended purpose and should be fabricated per the provided instructions.